Whisk egg in a medium bowl. Add rice, tarragon, panko, Parmesan, and salt and pepper. Mix until all ingredients are well combined. With wet hands, form palm-sized hamburger-shaped patties. Heat oil in a large skillet over medium-high flame. Place patties in pan and cook until both sides are nicely browned, about 3-4 minutes each side. Remove from pan and place on clean paper towels. 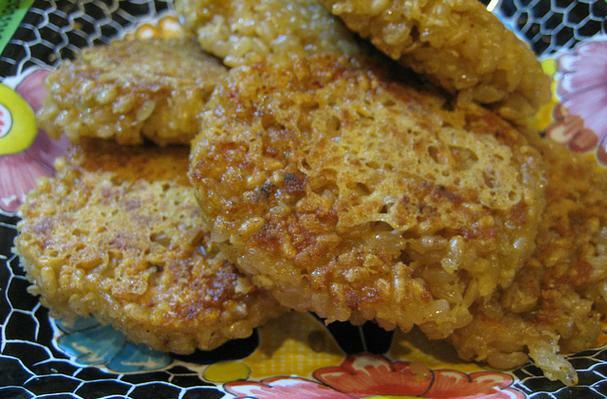 This is a great recipe to use up leftover rice! Substitute Parmesan and tarragon with your favorite cheese and herbs, such as cheddar and dill or chives.